IBASE Technology has this week unveiled a new fanless mini PC they have created to offer users a small form factor, Internet of Things system, powered by a 5th Generation Intel Core i75650U or ir-5350U processor supported by 4GB DDR3L RAM. 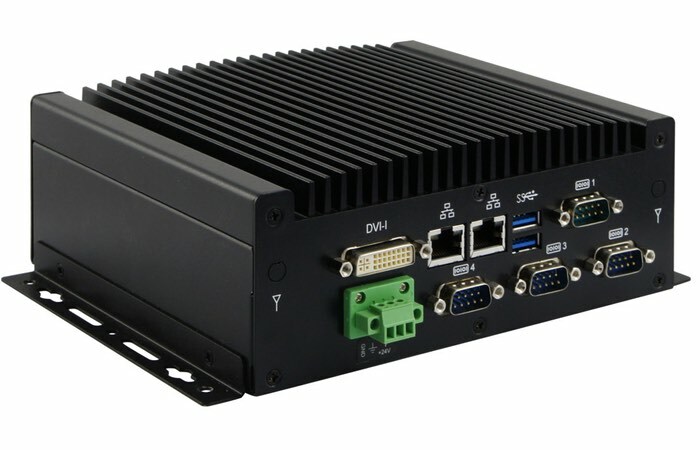 The new ASB200-909 comes with low power consumption and supports an optional 60W power adaptor, VESA mount bracket, as well as a 12V~24V DC wide-range power input, via the handy terminal block on the rear of the case, as you can see in the image above. Connections include 4 x serial ports, 2 x USB 3.0, 2 x USB 2.0, 1 x DVI-I, 2 x RJ45 Gigabit Ethernet connectors, a CFAST socket, HDD LED and power button. Unfortunately no information on pricing or worldwide availability has been released as yet by IBASE Technology , but as soon as information comes to light we will keep you updated as always.